The composer Felicien David had a long and fairly successful career as a composer in 19th century France, but like many his name is now almost only a note in the record books. Things seems to be changing, his symphonic ode Le Desert was released in 2015 (see my review) whilst his opera Herculanum was performed at the Wexford Festival last year. Now Palazetto Bru Zane and Ediciones Singulares are filling in further gaps by releasing a three CD set which aims to widen our knowledge of David's music. Francois-Xavier Roth conducts Les Siecles, the Flemish Radio Choir, Chantal Santon-Jeffery (soprano), Julien Behr (tenor), Josef Wagner (baritone) and Jean-Marie Winling (speaker) in David's second symphonic ode, Christophe Colombe, Herve Niquet conducts the Brussels Philharmonic in the overture to La Perle du Bresil, Le Jugement Dernier, and Symphony No 3 (with the Flemish Radio Choir) , and Niquet conducts the Flemish Radio Choir and Francois Saint-Yves (organ) in Six Motets, Cyrille Dubois (tenor) and Tristan Raes (piano) perform a selection of melodies, Pascal Monlong (violin), Pauline Buet (cello), David Violi (piano) perform Trio No. 1, and Jonas Vitaud (piano) performs a selection of piano music. The largest work, by far, on the disc is the symphonic ode, Christophe Colombe. This is for soloists, speaker and orchestra and is very much a follow up for Le Desert; Felicien David was very much in the vanguard (along with Berlioz) of experiments with symphonic form. In fact, the symphonic ode was more popular than we realise; most of the works have dropped out of circulation except for Berlioz's experiments (La Damnation de Faust, Romeo et Juliette and Lelio) but the admirable book which accompanies the Cd set includes a list of 13 works in the symphonic ode category performed between 1844 and 1850! Christopher Colombe is in four movements, The Departure, A Night in the Tropics, The Revolt and The New World, presenting not so much a narrative as a series of snapshots. The soloists play various characters, Colombus himself, a sailor Fernand and his beloved Elvire to whom he has to say goodbye, along with other sailors and even a female Indian. But it is in the more descriptive passages where David seems to be at his strongest. The narrative sections seem rather stuck in 'characteristic music' mode, whereas in the orchestral descriptions we hear a real voice, aided by the highly poetic narrative spoken by Jean-Marie Winling. 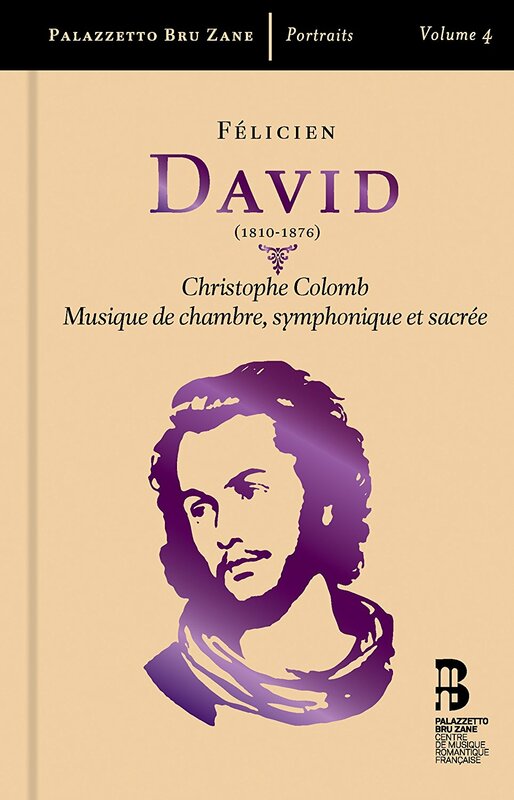 In style, it is tricky to pinpoint David's music, you can hear clear influences of Berlioz but without the really distinctiveness of Berlioz's orchestration and musical imagination, and there are also hints of Gounod too. The overture to the opera comique La Perle du Bresil is an attractive pot-pourri of vaguely exotic tunes (the work was his first opera). It would definitely make an attractive concert opener. I am less sure about Le Jugement Dernier which was written as the final apocalypse of the opera Herculanum but cut before its premiere. It is undoubtedly grand, and striking in its way with some lovely moments but never quite reaches the climax of the last Judgement that you expect. It is Mendelssohn whose music seems to come to mind when listening to David's Symphony No. 3. In four movements, it is a correct work, yet full of charm. An amiable first movement, leads to a gentle second, and the perky scherzo leads to an even perkier final movement which suggests an overture to an opera comique. The second disc concludes with a group of works which show Felicien David in entirely different mode, six motets. These are, mainly, for choir and organ (though one is unaccompanied) but the organ seems to support rather than add an independent voice. David does seem to bring a nice ear to this music, it is far more than academically correct, and some of the motets would be worth investigating by modern day choirs (though some are somewhat long for modern services). We get a variety of textures and moods, and both Pie Jesu and Omenes gentes seem striking. The third disc opens with one of the highlights of the whole set, a group of seven melodies performed by Cyrille Dubois (tenor) and Tristan Raes (piano); La ramier, Eoline, Cri di charite, Tristesse de l'Odalisque, L'Egyptienne, Le Jour des morts, Le Rhin allemand. Dubois has a lovely lyric tenor voice and sings the songs with great beauty of phrase and care for the words. David's songs elicit great melodic charm and lyric beauty, and in the strophic ones there is always a strong sense of narrative running through. But, it has to be said, that some of the strophic ones are quite long, and need careful attention to the texts to get the best from them. But other songs are more complex, Cri di charite has a sense of dramatic recitative and a fluidity of structure, whilst Le Jour des morts is sombre with hints of the East in the piano. Throughout Raes provides highly characterful piano accompaniment. The Trio No. 1 is performed by Pascal Monlong (violin), Pauline Buet (cello), David Violi (piano). It is a charming piece, with a lovely singing quality to the instrumental writing and a nice interaction between the players. This sense of melodic charm continues into the selection of piano music, gracefully performed by Jonas Vitaud. The fact that he had real experience of the East means that we perhaps expect more of David's music than we should. Though he treats exotic subjects, his music is firmly of its time and any references to exotic music are carefully woven into David's own style. What this set does do is to place his music firmly into context, giving us something of the broad sweep of his musical interest. And the performances on the disc are admirable, allowing the melodic charm of the slighter works to come out whilst relishing the quirky drama and poetics of the larger ones like Christophe Colombe. The CD book includes some valuable background to Felicien David and his music with essays by Ralph P Locke, Gunther Braam and Alexandre Dratwicki, along with Saint-Saens In memoriam Felicien David.